We asked architects how they evaluate someone’s sustainability literacy in a single question. Tassafaronga Village by David Baker Architects. 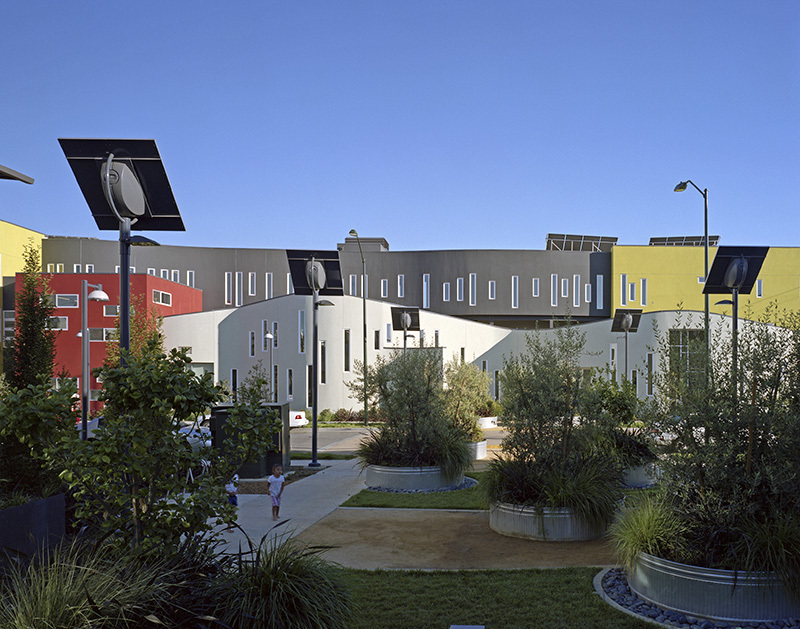 This affordable housing project proves that high levels of environmental performance can be achieved with a very low budget by relying on strong, foundational design skills rather than expensive technologies. Photo: Brian Rose / David Baker + Partners, Architects. License: CC BY 3.0. How do you measure someone’s sustainable design literacy? As we discuss in Sustainable Design Literacy: A Foundation for Transformed Practice, no single exam or other measure tells the whole story. We thought about writing our own, holistic, non-LEED-centric version of the LEED AP exam. We quickly recognized, however, that it’s the discussion questions, not multiple-choice, that show someone’s understanding. So we asked a variety of educators and design leaders what questions they might use to start a discussion that would help them assess a designer’s knowledge and understanding of sustainable design. Consider using these questions to evaluate how you think about sustainable design, or to evaluate a designer you are thinking of hiring, or someone whom you are thinking of adding to your project team. What questions do you like to ask (or would you like to be asked) to evaluate expertise in sustainable design, and generate a fruitful discussion? Please comment below. What he’s looking for: The correct answer is to question the premise. In doing so, revealing conversations can happen. “What's the one strategy you'd recommend to increase passive performance of this building? “What's one thing that you did differently on this project, that you haven't done on any other projects? What she’s looking for: Overall depth and breadth of thinking on design process. What she’s looking for: “That would be the high-level question that anyone should be able to answer, and there would be several different follow-up questions to dig deeper,” depending on the strategies they mention. What he’s looking for: “If they like it, why? If not, why not? Does it go far enough? Why not?” There aren’t any right answers, but a discussion about LEED as a tool will reveal a lot about how a person thinks about the industry, and what their knowledge level is.